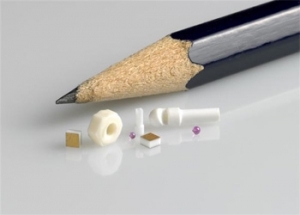 Through its affiliate the Technical Glass Company, Goodfellow is now able to supply a wide variety of ceramic and glass microcomponents, both standard items and precision-machined components to customer specifications. The Technical Glass Company, part of the Goodfellow Group of Companies, is a supplier of specialist glass and ceramic materials and components for scientific and industrial applications. Examples of such parts include: ultra-thin glass microsheet (from 0.030mm thickness) for use as transparent substrates and electrical insulators; precision balls (from 0.15mm diameter) for use as optical components and precision spacers; micro optics such as prisms (from 0.5mm), lenses (from 1mm diameter) and windows (from 0.5mm); injection-moulded ceramic microcomponents for surgical equipment and fibre optic applications; and polished sapphire bearings and nozzles with bores in the sub-mm range. Other items are available upon request.